The Persistence Market Research report on global high-strength RTD malt beverages market analyzes opportunities in the market and presents updates and insights pertaining to various segments of the global high-strength RTD malt beverages market over the forecast period, 2018–2026. This report, provides forecast and analysis of the global high-strength RTD malt beverages market. It provides historical data of 2017 along with estimated data of 2018, and forecast data up to 2026 in terms of revenue (US$ Mn) and volume (liters). The report also includes macroeconomic indicators along with an outlook on high-strength RTD malt beverages for global market. It includes drivers and restraints of the global high-strength RTD malt beverages market and their impact on each region during the forecast period. The report also comprises the study of current issues with consumers and opportunities for high-strength RTD malt beverages products. It also includes value chain analysis. In order to provide users of this report with comprehensive view of the market, we have included detailed competitiveness analysis and market key players and strategy overview. The study encompasses market attractiveness analysis by nature, flavor, packaging, distribution channel and region. The report includes high-strength RTD malt beverages market company profiles and the revenue generated from the companies across North America, Latin America, Europe and Asia Pacific. The high-strength RTD malt beverages market is segmented on the basis of nature, flavor, packaging, distribution channel and region. On the basis of nature, the global high-strength RTD malt beverages market is segmented into, natural and conventional. Clean label trend across the globe has contributed towards the increasing market growth rate of natural segment in the global high-strength RTD malt beverages market. On the basis of flavour, the global high-strength RTD malt beverages market is segmented into grapefruit, lime, orange, cherry, cola, strawberry, apple, peach, mixed flavor and others. Women across the globe are highly demanding for new flavors in the high-strength RTD malt beverages category which is pushing the revenue generation in the high-strength RTD malt beverages market in the near future. On the basis of packaging, cans segment is expected to account for high revenue share in the global high-strength RTD malt beverages market during the forecast period. On-the-go trend has been influencing the global high-strength RTD malt beverages positively, thus, contributing towards the overall market growth. On the basis of distribution channel, the global high-strength RTD malt beverages market is segmented into, hypermarket/supermarkets, convenience stores discount stores, independent drink stores, and specialty retail stores. This report covers trends driving each segment and offers analysis and insights into the potential of the High-strength RTD malt beverages market in specific regions. Detailed profiles of the providers are also included in the scope of the report to evaluate their long-term and short-term strategies, key offerings and recent developments in the high-strength RTD malt beverages space. The global high-strength RTD malt beverages report begins with estimating the market in the base year in terms of retail sales and volume consumption. To arrive at the volume consumption of high-strength RTD malt beverages, overall consumption of alcoholic beverages across the globe has been taken into consideration. Furthermore, Persistence Market Research estimated volume data on consumption of flavored malt beverages for several countries by understanding the per-capita consumption for flavored malt beverages. PMR then determined the volume consumption of high-strength RTD malt beverages across various regions including North America, Latin America, Europe and Asia Pacific. Various factors such as production, per capita consumption of alcoholic beverages, per capita spending on alcoholic beverages have been taken into consideration to arrive at the volume consumption of high-strength RTD malt beverages in respective countries. Weighted average selling price for high-strength RTD malt beverages was considered to estimate the market size for top countries. These prices were captured in their respective countries and then converted into USD to offer forecasts in one consistent currency standard. Given the characteristics of the market, PMR triangulated the data based on supply side, demand side, and dynamics of the global high-strength RTD malt beverages market. To develop the global high-strength RTD malt beverages market forecast, PMR analyzed various factors to understand their respective impact on the target market. However, quantifying the market across the abovementioned segments is more a matter of quantifying expectations and identifying opportunities rather than rationalizing them after the forecast has been completed. It is imperative to note that in an ever-fluctuating economy, we not only provide forecasts in terms of CAGR but also analyze on the basis of key parameters, such as year-on-year (Y-o-Y) growth, to understand predictability of the market and identify the right opportunities. Another key feature of this report is analysis of the global high-strength RTD malt beverages market and the corresponding revenue forecast in terms of absolute dollar opportunity. This is usually overlooked while forecasting the market. However, absolute dollar opportunity is critical in assessing the level of opportunity that a provider can look to achieve, as well as to identify potential resources from a sales perspective in the global high-strength RTD malt beverages market. To understand key segments in terms of their growth and performance in the global high-strength RTD malt beverages market, Persistence Market Research has also presented a market attractiveness index. The resulting index should help providers identify existing market opportunities in the global high-strength RTD malt beverages market. The report covers an in-depth analysis of all components of value chain in the global high-strength RTD malt beverages market. In the final section of the report on the global high-strength RTD malt beverages market, competitive landscape is included to provide a dashboard view of global high-strength RTD malt beverages manufacturers. Persistence Market Research offers an eight-year forecast for the global high-strength RTD malt beverages market between 2018 and 2026. In a recently released report by the company, the global high-strength RTD malt beverages market is expected to register a CAGR of 6.1% during the forecast period. The primary objective of the report is to offer insights on the advancements and opportunity in the high-strength RTD malt beverages market. The study demonstrates market dynamics that are expected to influence the current challenges and future status of the global high-strength RTD malt beverages market over the forecast period. This report also offers updates on trends, drivers, restraints, value forecasts, and opportunities for manufacturers operating in the global and regional high-strength RTD malt beverages market. The scope of our study for high-strength RTD malt beverages includes commercially important high-strength RTD malt beverages available in the market. The global high-strength RTD malt beverages market by nature is segmented into natural and conventional. The natural segment is anticipated to grow at a robust CAGR in the global high-strength RTD malt beverages market over the forecast period owing to rising demand for natural flavors among consumers. 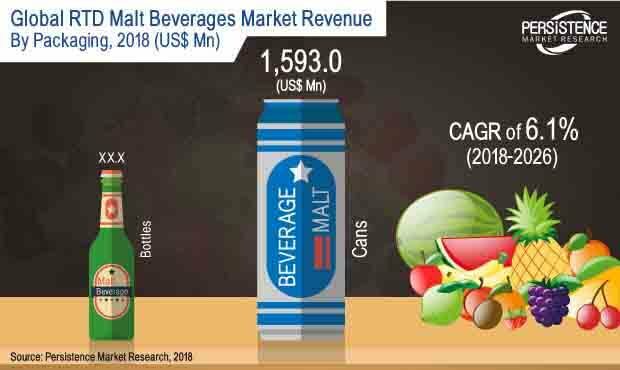 Consumers across the globe are demanding for beverages with natural ingredients which is pushing the revenue generation in the natural segment, hence the global high-strength RTD malt beverages market in the near future. Furthermore, cocktail based natural flavor has also been one of the most preferred flavors among consumers in the global high-strength RTD malt beverages market. The global high-strength RTD malt beverages market by flavor is segmented into grapefruit, lime, orange, cherry, cola, strawberry, apple, peach, mixed flavor and others. The apple flavor segment is expected to dominate the global RTD high-strength malt beverages market over the forecast period. The flavor is quite popular among women across the globe thus, resulting in its higher demand during the forecast period. Furthermore, mixed flavored high-strength RTD malt beverages in the global high-strength RTD malt beverages is also expected to represent significant market growth in the near future. High-strength RTD malt beverages have long been on retail shelves in North America market and are slowly penetrating other big markets such as France, China, Australia and others. By packaging, the global high-strength RTD malt beverages market is segmented on the basis of cans and bottles. The cans segment is expected to account for high revenue share in the global high-strength RTD malt beverages market in the near future. Manufacturers of high-strength RTD malt beverages across the globe are bringing drinks to retail shelves with innovative packaging and labels to attract consumers thus, helping the overall high-strength RTD malt beverages market growth in the near future. By distribution channel, the global high-strength RTD malt beverages market is segmented into, hypermarket/supermarkets, convenience stores, discount stores, independent drink stores and specialty retail stores. The hypermarket/supermarkets segment followed by specialty retail stores segment is expected to account for significant market share in the global high-strength RTD malt beverages market in the near future. Also, attractive offers offered by discount stores in the high-strength RTD beverages category is expected to offer immense market growth opportunity in the respective segment. The global high-strength RTD malt beverages report includes market share of each segment according to the region with analysis towards market trends respectively. By region the global high-strength RTD malt beverages market is segmented into, North America, Latin America, Europe and Asia Pacific. Popularity of high-strength RTD malt beverages among young consumers has been prime factor contributing towards the market revenue generation in the high-strength RTD malt beverages category in respective countries. A section of the report highlights the global demand for high-strength RTD malt beverages demand. It also provides a market outlook for 2018–2026 and sets the forecast within the context of the RTD high-strength malt beverages ecosystem, including the new product developments as well as product offerings in the global RTD high-strength malt beverages market. This study discusses key trends contributing to the growth of the global RTD high-strength malt beverages market, as well as analyses the degree to which drivers are influencing the global market. In the final section of the global high-strength RTD malt beverages report, a competitive landscape has been included to provide report audiences with a dashboard view. Key categories of providers covered in the report are global RTD high-strength malt beverages key players. Detailed profiles of the providers are also included in the scope of the report to evaluate their long-term and short-term strategies, key offerings and recent developments in the global high-strength malt beverages space. All statements of fact, opinion, or analysis expressed in reports are those of the respective analysts. They do not necessarily reflect formal positions or views of Persistence Market Research. NOTE - All statements of fact, opinion, or analysis expressed in reports are those of the respective analysts. They do not necessarily reflect formal positions or views of Persistence Market Research.